Here's something you've probably figured out about me: I like to throw parties. I love to see my friends and family all dressed up and ready to relax, tell jokes and eat some good food. 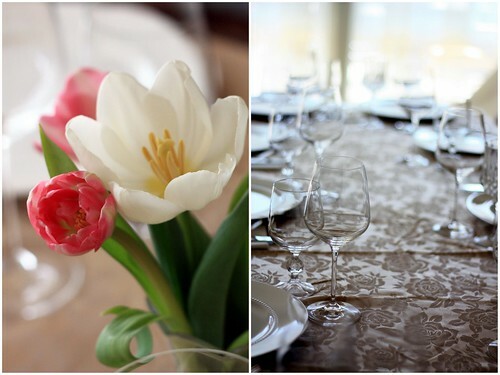 I love seeing my dad tease my sister, my mom dashing around the kitchen with a glass of champagne, and all the other familiar patterns that always emerge when we all get together. I'll tell you something else - I have a hostess apron. A real, cute, frilled hostess apron that makes me feel like I want to twirl my skirt (and sometimes, I really do, kind of like a 5 yr old). Generally, I cook in an old ratty t-shirt that I'm not afraid to splatter with flour and butter, but a half hour before the guests are supposed to come over, I'll leave the kitchen and pretty myself, and then I will put on my hostess apron and make everyone believe that I've been standing in the kitchen for hours (when in fact, 90% of the work was done the night before and the day of, I pretty much frosted the cake and mixed up a green salad. I might have put things on platters, too, but I was eating scraps of cake so my brain is a little hazy on that point). This baked french toast (ok, it's more like a bread pudding) lets me get out of the kitchen that precious half an hour earlier. You do all the prep work the night before (there isn't much of it) and then about an hour before the guests arrive, you pop this baby into the oven and voila, out comes a perfect, fluffy, sweet treat that everyone will love. Minimal effort + maximum taste = pretty darn awesome. Oh, and just in the interest of full disclosure, I drizzled Nutella over my portion. I'd tell you how good it was, but it's a little x-rated, so you'll just have to use your imagination. I love this little book. So far, the crepes were stellar and this bread pudding/french toast disappeared faster than I could stick a spoon in it. The book is sunny, homey and inviting with delicious photographs, and I love the way it has simple things - cheese and tomato galette, almond french toast, pear and almond tartlets, just to name a few - that I conceptually knew existed, but now cannot imagine living without. Make the topping: peel, core and cut the apples into 1/4-inch thick slices. Heat the butter over medium heat until melted, then add the apples and cook, stirring a few times to coat in butter, until the apples are tender (about 10 minutes). Turn off the heat and stir in sugar and spices. Set aside. Butter a 9x13-inch baking dish. Cut the bread in half to make triangles and either toast it lightly or leave it out on the counter for a few hours. 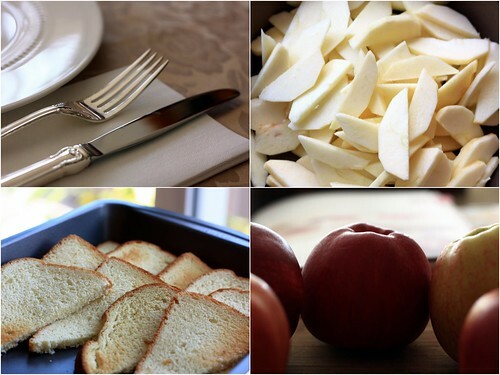 Arrange the bread in the dish in two rows, so the slices overlap. In a medium bowl, beat the eggs with the sugar, milk and vanilla until smooth. Pour the custard over the bread, pressing the bread down a bit if it's poking up above the milk. Spoon the apples over the top. Cover and refrigerate overnight. Heat the oven to 350F. Uncover the baking dish and bake 50-60 minutes, until the custard is set and doesn't shimmy when you shake the pan. It will puff up and brown slightly. Remove from the oven and let it rest for 10 minutes before serving. I like to throw dinner parties too; especially brunches. This looks incredible. When i cook for finner parties i too cook in a old things and change before the guest arrives , looking realy fresh . I too love to see my family and friends anjoying the food i have prepared for them. Nothing beats that feeling . love apples! This looks delicious! Fabulous idea, I bet it tastes delightful! 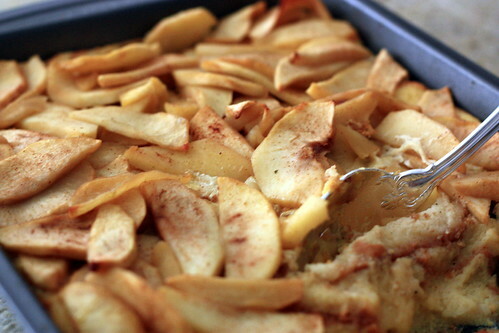 Oh, I LOVE baked French toast... and I will be trying this one soon :). This looks soooo tasty and easy! What a great idea! I need to get a twirl-worthy apron. Wonderful! I know I would devour my share and then some!! i have a frilly, fantastic apron but sadly, i've never had occasion to wear it. maybe that should be my goal. Just in time for my company. Good timing! This is perfect for times when my family is here during the holidays! Something the adults as well as the little guys would l♥ve to dig into! You, my dear, have my attention! Your pictures are beautiful. I was just literally searching for a baked french toast recipe yesterday, so this is perfect timing! Just lovely...should try this for a special weekend brunch. Love your pictures. By the way, thank you for visiting my site. I have never tried baked french toast. This looks yummy! What a great make ahead brunch dish. I would drizzle maple syrup on top. Yum! A perfect brunch dish! 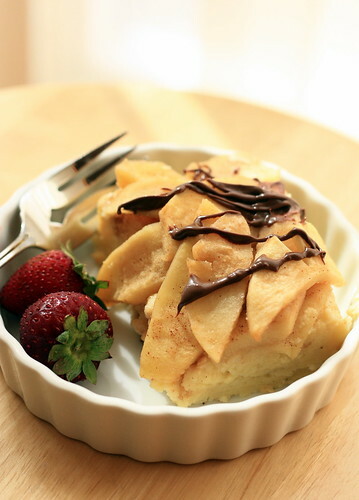 I love the apple topping! Yum! Of course I remember, but really? I never knew that! And I do remember guests dropping by at any time of day and night. :) Those were the days before we all demanded perfection from each other and ourselves! This looks so homey and delicious. I will have to give it a try. oh yummy! I love french toast--in all its forms! Made this dish this morning for guests, served it with yummy smoothies and they said everything should belong in a food magazine! Many thanks! !